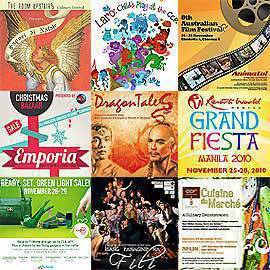 Party at a Pinoy fiesta, watch animated films from the Down Under, shop for a cause, and more! Plus, where to go for the hottest gigs. What’s happening in Manila this long weekend? SPOT.ph zeroes in on the events you shouldn’t miss. 1. WATCH A FIERY TALE. Catch Dragon Tales on selected dates from November 27 to December 5 at the Philippine Educational Theater Association (PETA) Theater Center, No. 5 Eymard Drive, New Manila, Quezon City. 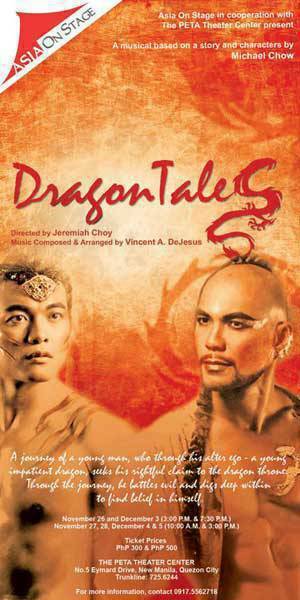 The production tells the story of a struggling writer, Miki (Gani Karim) and a magical Dragon Realm where his two alter egos--a young impatient dragon, Tazarek (Miguel Vasquez), and his king-to-be half-brother, Siu Long (Joel Molina)--fight to claim the dragon throne. Their battle opens up the wounds of their family’s past and the secrets of the Dragon Realm. For reservations and bookings, contact 881-0984, (0917) 556-2718, (0915) 295-7550 or email dragontalesmanila@gmail.com. 2. GET CARTOON-CRAZY WITH FILMS FROM THE DOWN UNDER. 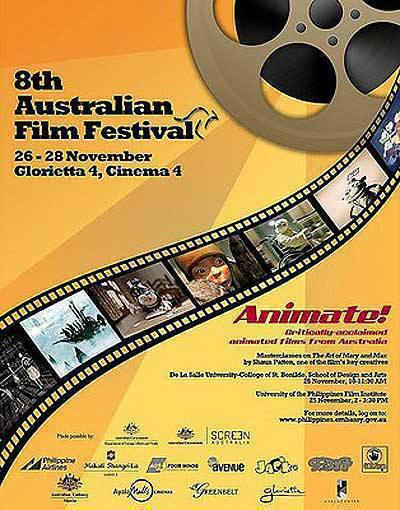 Catch the 8th Australian Film Festival featuring animated films from November 26 to 28 at the Glorietta 4 Cinema 4, Ayala Center, Makati City. The festival will open with the special screening of Mary and Max, a claymated film by Adam Elliot. To see schedules, click here. For more details about the featured films, log on to www.philippines.embassy.gov.au. For inquiries, call the Glorietta 4 Concierge at 752-7272. 3. PARTY HEARTY AT A PINOY FIESTA. Join the festivities at the Resorts World Manila Grand Fiesta Manila 2010 from November 25 to 28 at Resorts World Manila, Pasay City.The lineup of events include concerts featuring some of the country’s top bands and artists like Pedicab, Sandwich, Urbandub, Franco, Arnel Pineda, and Jed Madela. Also witness the Grand Fiesta Run 2010 and the Light Festival. For more updates, log on to www.rwmanila.com. For inquiries, call 836-6333. 4. FEEL LIKE A KID AGAIN. 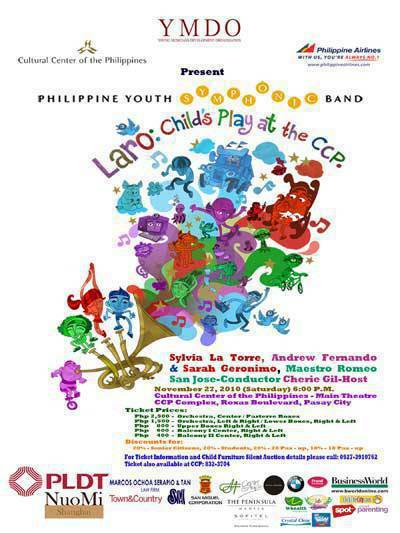 Catch Laro: Child’s Play at the CCP on November 27, 6 p.m. at the Main Theater (Tanghalang Nicanor Abelardo) of the Cultural Center of the Philippines (CCP), Pasay City. Traditional children's songs like the "Sitisiritsit" and the "Tongtongtongtong Pakitong," among others, will be presented in a fresh, modern way, and in genres more familiar to today's youth like pop, rock, jazz and even reggae. The concert will be hosted by actress Cherie Gil and will feature Andrew Fernando, Sarah Geronimo, and Sylvia Latorre. Ticket prices are P2,500 for Orchestra Center/Parterre Boxes, P1,500 for Orchestra Left and Right/Lower Boxes Left and Right, P800 Upper Boxes Right and Left, P600 for Balcony I Center, Right and Left, and P400 for Balcony II Center, Right and Left. Senior citizens and students get 20% off. For tickets contact (0927) 391-0762 or 832-3704. 5. SHOP FOR A CAUSE. 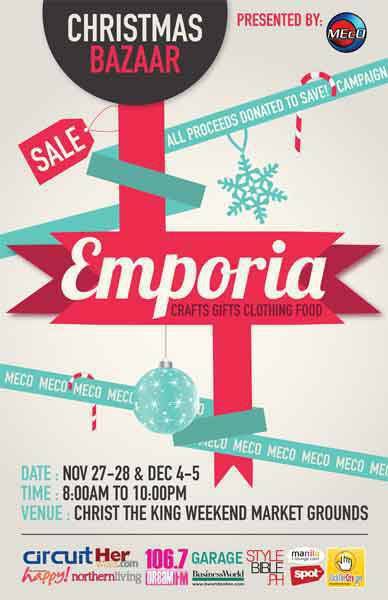 Be at the Emporia Bazaar 2010, a two-weekend Yuletide bazaar from November 27 to 28 and from December 4 to 5, 8 a.m. to 10 p.m. at the Christ the King Weekend Market Grounds, Greenmeadows Avenue, White Plains, Quezon City. The bazaar will feature finds from student-owned businesses, online retailers, as well as other well-known establishments. Items include shoes, accessories, bags, baked goods, and more. Proceeds of the bazaar will go to Ateneo Management Economics Organization’s (MEcO) SAVE! Campaign, a MEcO partnership with Pathways and Silid Aralan Inc. The project teaches financial responsibility to elementary and high school students in public schools. 6. FALL IN LOVE WITH EL FILIBUSTERISMO ALL OVER AGAIN. Catch Dulaang UP’s Isang Panaginip na Fili, written and directed by Floy Quintos, on selected dates from November 24 to December 12 at the Wilfrido Ma. Guererro Theater, University of the Philippines, Diliman, Quezon City. The production is a rework of Jose Rizal’s El Filibusterismo. It stars Franco Laurel, OJ Mariano, Nazer Salcedo, Arman Ferrer, Floyd Tena, Mica Pineda, Janine Santos, Ces Quesada, and Emlyn Santos. For schedule and ticket inquiries, contact the Dulaang UP office at 926-1349. 7. KEEP YOUR KITCHEN KNOW-HOW IN CHECK. 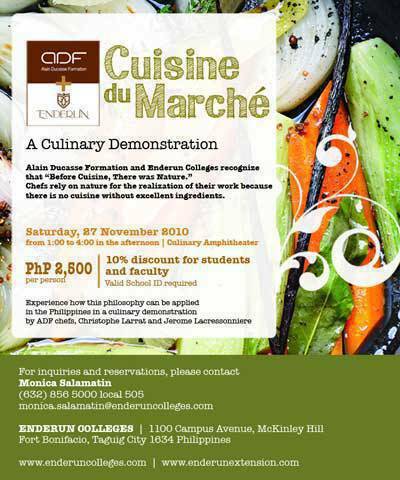 Sign up for Cuisine Du Marche, a culinary demonstration with Chef Christophe Larrat and Chef Jerome Lacressonniere on November 27, 1 to4 p.m. at the Culinary Ampitheater of Enderun Colleges, 1100 Campus Avenue, McKinley Hill, Fort Bonifacio, Taguig City. Registration fee is P2,500 per person. Students and faculty can get 10% off upon showing their valid school ID. For inquiries and reservations, contact Monica Salamatin at 856-5000 local 505 or monica.salamatin@enderuncolleges.com. 8. MAKE THEM GREEN WITH ENVY. 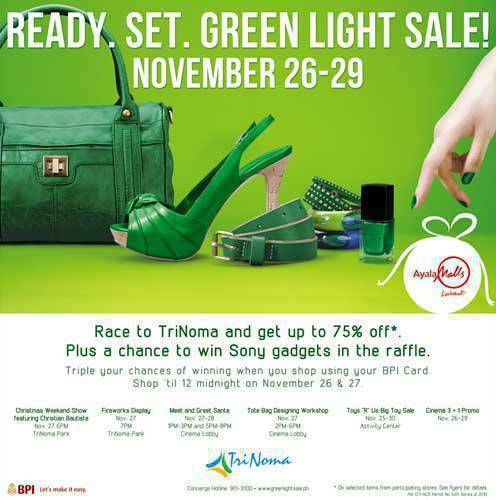 Don’t miss the TriNoma Green Light Sale from November 26 to 29. Get up to 75% off on selected items from participating stores. Triple your chances of winning Sony gadgets in the raffle when you shop using your Bank of the Philipppine Islands (BPI) Card. Shop until midnight on November 26 and 26. Click here to see the other events lined up at TriNoma. 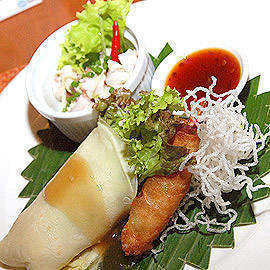 For inquiries, call the TriNoma Concierge at 901-3000. 9. EAT, SHOP, AND BE MERRY! 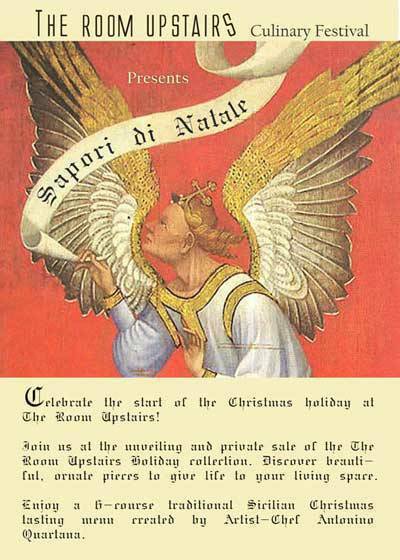 Be part of Sapori di Natale, The Room Upstairs’ Culinary Festival on November 27, 6 p.m. at The Room Upstairs, Nicanor Garcia St., Bel-Air 3, Makati City.There will be a private sale of The Room Upstairs Holiday Collection and a six-course traditional Sicilian Christmas tasting menu by Chef Antonio Quartana. For inquiries, call 899-9318. View Maria Cruz’s and Elizabeth Newman’s exhibit titled I want you to know. 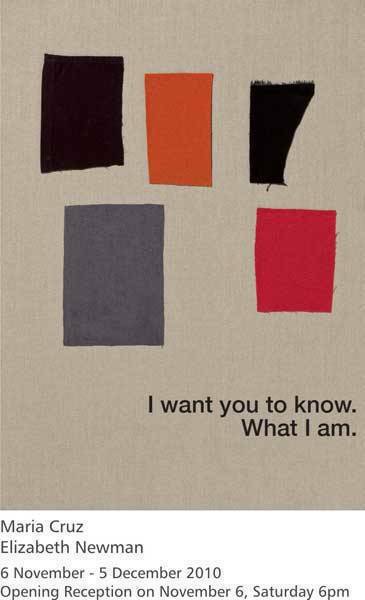 What I am., which runs from November 6 to December 5 at the Mo_Space Gallery, 3/F Mos Design Bldg., Bonifacio Global City, Taguig. The current project brings the two artists together, twenty years later, to once again see what art making can tell us about subjectivity in a world increasingly inhospitable to human subjectivity. The project for Mo Space is a selection of recent works from each artist. Cruz (b.1957), born in the Philippines, now lives in Berlin, and Newman (b.1962) is an Australian from Melbourne. For inquiries, call 856-2748 ext. 2 or 3. 19 East - Mocha Girls and Kell’s Playlist, 9 p.m.
Bagaberde Grill and Bar - Daughters 5 and Side A, 9 p.m.
B-Side - Dubplate Manila featuring Doshy, Red-I, Don P., Mulan, and Soulflower, 9 p.m.
Capone’s Bistro - Zion Friday Nights featuring Blues Train, Jeck Pilpil, and Peacepipe, 9 p.m.
Handlebar Bar and Grill - Tricia n’ Miguel Ortigas, 9 p.m.
M Cafe - Got Soul Fridays featuring Ms. Badkiss with special guest John Monreal, 10 p.m.
Obsidian Bar and Grill - Xtian Production presents Tanya Markova, Letter Day Story, Soapdish, Eeveee, 6 p.m.
Penguin Cafe - Doki and Reggae Mistress, 8 p.m.
Route 196 - Paint A Vulgar Picture (Picture) featuring Dead Pop Stars with Tanya Markova, 8p.m. Saguijo - Sonic Boom (LTBA),9 p.m.
70’s Bistro - Kalayo and Peryodiko, 9 p.m.
Izakaya - Sake To Me Baby featuring music by DJ Steal and DJ Nina, 5 p.m.
Martinis - Music & Wine with Elian Habayeb, 9 p.m.
Obsidian Bar and Grill - Monty, 6 p.m.
Penguin Cafe - Myko Maca, Nimbus, and Snafu, 8 p.m.
Route 196 - Blaster Studios at Route 196 featuring Stonefree, Chubibo, Dr. Mindbender, Penguin627, and Manskee 8 p.m.
Saguijo - Folk U Like it’s Hot featuring Fando & Lis, Jesse Grinter (Gaijin), Luke Chow (HK), and Tao Aves, 9 p.m.
Obsidian Bar and Grill - Audio Lokah Productions, 6 p.m.
70’s Bistro - Coffeebreak Island and Dong Abay, 9 p.m.
Izakaya - Moshi Moshi Monday featuring music by Aimee Macoy, Marie Garcia, and surprise guests. Hosted by Ivan Zalameda, 5 p.m.
70’s Bistro - Talahib and Makiling Ensemble, 9 p.m.
Bagaberde Grill and Bar - Headrush, 9 p.m.
Izakaya - Izakaya Unplugged featuring music by Norby of Overtone and Junji of Velcro. Hosted by Raj Sadhwani, 5 p.m.
Last Home Resto Bar - Shift and Swissy, 10 p.m.
Martinis - Red Cats, 9 p.m.
Obsidian Bar and Grill - Killer Kingkong Productions presents Blasphemous Cremation, BURP, Cult of Mitras, Downgrave Soul, Burning Spampy, Burnhouse, Genital Grinder, Hellwrath, Retractory, Onering, Subculture and Zalvija. Ticket price is P80, 7 p.m.
Saguijo - Fast Forward (LTBA), 9 p.m.
Izakaya - Dojo Wednesday hosted by Jec Cantillon, 5 p.m.
Route 196 - Stripped at Route 196: The Christmas Edition featuring Ebe Dancel, Dian Montes, Joey Santos, Edu Ibazeta, Cat Cortes, and CJ De Silva, 8 p.m.
Izakaya - Kiss Kiss Bang Bang featuring DJ Euric, DJ Chazz, Julio V, Paco Gun, and special guest DJs, 5 p.m.
Eivissa - Twisted Fridays featuring DJ Marvin, DJ Jet, and DJ Markie Madness, with MC Bigdaddy, 10 p.m.
Encore - Mixology Fridays featuring DJs Martin Pulgar, Marc Naval, BigBoy Cheng with MC Warren, 10 p.m.
LAX - Blackout Fridays featuring DJ Buzz and MC Jaygo, 10 p.m.
Manor - Jive Fridays featuring DJs Mark Nicosia, Bad Boy Jeff, Ronian Poe, Acid Burn, and MC Paolo on the mic. 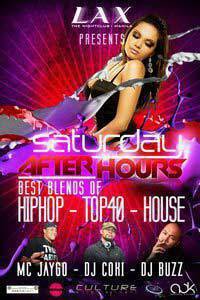 Hosted by Stephen Ku, Bingo Manahan, and The Jive Crew, 10 p.m.
Amber UltraLounge - Envy Saturdays featuring music by DJ Chester Canlas, 10 p.m.
LAX - After Hours featuring DJ Coki and DJ Buzz, with MC Jaygo on the mic, 10 p.m.
Manor - Saturday Supreme featuring DJ Buzz, DJ Slick J, DJ Carlo A, DJ Ace Ramos, with MC Boo, 10 p.m.
Republiq - Pure featuring music by Marc Naval, Martin Pulgar, and Chewy Ramos, 10 p.m.
Prive Establishment - Prive Saturdays featuring DJ Raffy and DJ Bombi, 9 p.m.
Nu.Vo - G Mondays: Girls Night at Nu.Vo featuring DJs Arnel Genterone, John Monreal, and Matthew Carbonell, 9 p.m.
LAX - Next Episode Wednesdays at LAX featuring DJ Ron and DJ Coki., 10 p.m.
Manor - Wicked Wednesdays featuring music by DJ Acidburn and DJ Ace Ramos with "Hype Man of the Year," MC Paolo, 10 p.m.
Bliss UltraClub - Model’s Closet Thursdays featuring DJ Chinaman, DJ Lime, DJ Ace Ramos, and DJ Richard, 10 p.m. 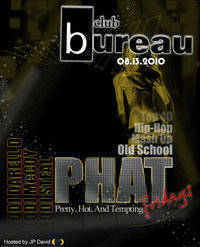 The KEG - Legalized Thursday featuring J Rad, 10 p.m. The Reserve lounge - Habit Thursdays featuring Bobby Maddattu and Ray J Umali from Looped Beat Academics and DJ Mark Nicosia with special guest DJs, 10 p.m.
Supreme Court dismisses 2004 case against Jason Ivler; Marlene Aguilar says, "Justice is served"